February 23rd, 2011, after a routine appointment at Downtown Women OBGYN in Soho, my wife, Mary, was instructed to go directly to the emergency room at NYU Tisch. She was having extreme back pain, chest pain, and shortness of breath. For precautionary measures they wanted to do additional testing to ensure it wasn’t complications with her pregnancy. Several hours later, while working in Sandusky, Ohio, I was on a frantic phone call with Mary, as she explained to me that due to severe complications in her pregnancy (caused from HELLP Syndrome), that our unborn child of only 28 weeks, would have to be taken out of the womb via emergency c-section. At that moment, both Mary and our unborn daughter had a high risk of fatality. It was the one of the scariest moments in my life! Remy was born via cesarean at 7:23 PM. I heard the news while sitting on a plane at Cleveland-Hopkins International Airport. I felt joy, sorrow, and helplessness. I cannot begin to describe the flood of other emotions that I was filled with during my flight home. To top it off, I eventually had to de-plane for a later flight. Through the eyes of a first time Father, the story of the 2 lb love of my life begins. Without question of any post I have previously written, this one carries more emotion than ever before. I will usually sit on my laptop and try to convey some experience, some diagnoses, some surrounding and mix it all together. I want you as friends, family, and followers to understand what we are experiencing. What Remy’s status is. I try to paint a picture of what it is like in here and what it is like when I am not here. I want you to connect. I want this to be a chronicle that I can go back and show to Remy when she is older, something to reflect in a time in her life when it seems fit. I want this to be a resource for those who may be going through similar situations and need to relate. I often go in ready to write about one thing and end up writing something different and if you read the blog you know my posts can become very long. I don’t think I possess the ability to convey exactly what Mary and I went through this past Thursday. It was the most frightening moment in my 38 years. On Thursday, both Mary and stood by as we watched our little Remy almost leave us! The space above represents emptiness. That was the strongest feeling that was felt. It began with an attempt to transfer Remy from her oscillator to a gentler machine known as the ‘Jet’. It started with just three personnel and ended with a huddle of about 15 to 20. The tone was one of the utmost concern, panic and fear! There was screaming, crying, falling to the floor, panic! Our Remy was seconds away from never breathing another breath again. Everything around us became blurry. We honed in on the possibility of our child struggling to survive and it was as if we had entered into another dimension. Our hearts stopped. We could feel our bodily functions like we never have before. We were helpless. I mean HELPLESS! It is was our absolute WORST nightmare coming to fruition in front of our very eyes, except we were awake, the kind of awake you never want to be! During this moment we truly realized as much as we thought we knew what love is, as much we thought we could describe love, we never even had a clue how strong our love was until that love was being TAKEN AWAY FROM US! Remy…………..our girl, our little lady, our bugaboo, our sunshine, our LIFE within us, WAS NOT READY FOR THIS. 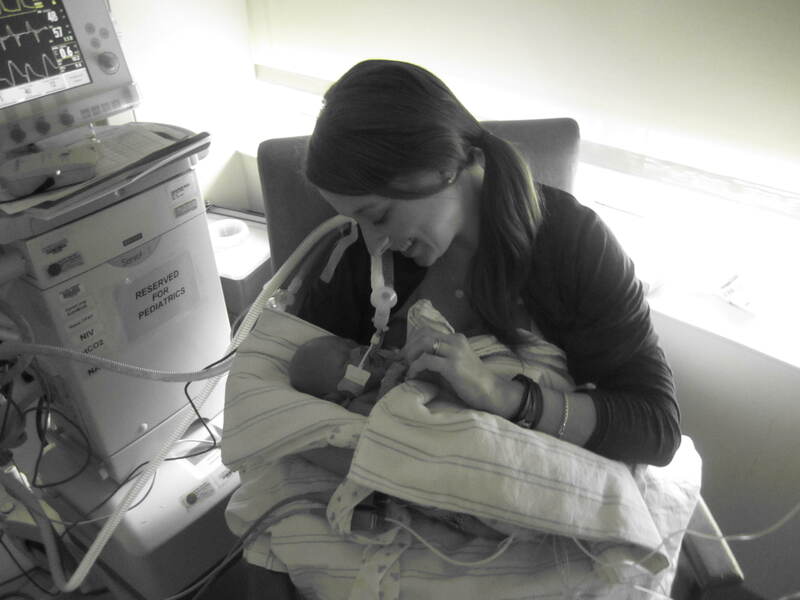 Following this event we were told by many doctors and personnel at the NICU that we should enjoy every moment we have with her, that we should be prepared for the worst, that there are so many horrific possibilities in our’s and Remy’s future, both long and short-term. We have heard similar things from the staff before. This was different. The tone was blunt and so serious. The expectations are so questionable. It is now Sunday morning and Remy still has major leaps she must make and the situation is still very critical and more real than ever. Remy’s response in the 12 hours following this heart-wrenching, and aging event was nothing less than miraculous! She made overnight progress that was simply astounding! This is not just from a parent’s perspective, but from those on the staff caring for her day and night. For the next 60 or so hours up to now she has been very non responsive, except for random movement and hand holding, which melts our hearts. She is currently in a holding pattern, but also gradually heading in the wrong direction. There is immense concern for her in so many areas of her health. In this post I don’t have the energy to explain all of the medications, attempts to help her gain strength, and symptoms she is dealing with. 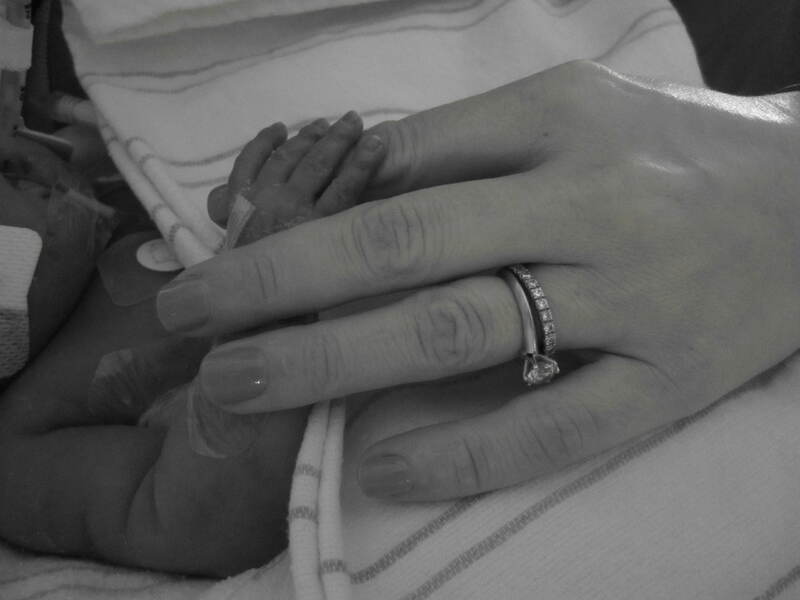 Our baby girl has shown unthinkable strength. She is not ready to give up on us and herself. She has a great amount of healing to do to recover from her recent surgery while also having to recover from preexisting conditions and battle the unpredictable day to-day hurdles she faces. It do not have the option, but I would endure a lifetime of torture and solidarity to see my baby get healthy and live a long happy life! Our spirits have been tested more than ever before over the past four days. 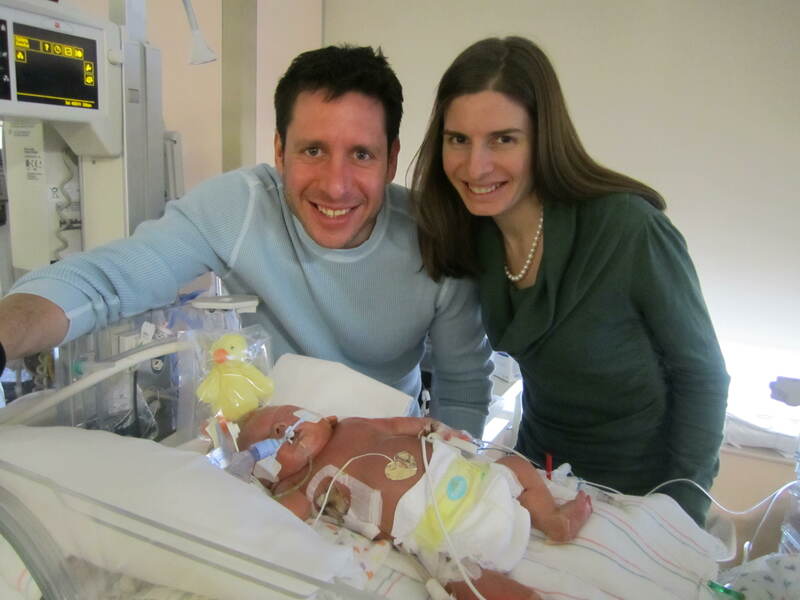 While our baby’s health is the biggest concern of all our psychological status is unpredictable. We know that we are parents. We know that we must continue as any other parent and maintain our strength and dig as deep as humanly possible. We advocate when we see fit and try to influence as we see fit and let the experts do what they must and continue to talk and touch our little angel everyday. Day by day, hour by hour, minute by minute! 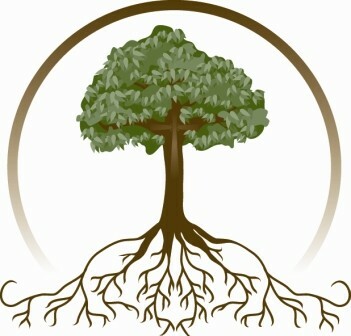 The picture below represents strength that starts from the roots. Our Remy has strong roots that date back to her ancestors. We want to see her flourish and grow into her own wonderful ‘self’! Remy has been having distention in her bowels since she was born, in the beginning of her life she was tested for everything, from NEC (ecrotizing Enterocolitis) to Hirsphrung’s disease. Nothing was found and her bowels were assumed just premature. A rectal biopsy was done and nothing surgical was found. Then she got septic. As you all know Remy has been sick for some time, and has progressively been getting better. She has still been having lung and gut issues, along with seizures. She is 40 weeks now and if she would have been a healthy baby, would have been home by now. Last week Remy had a CT scan on her lungs and intestines to look for something we have been missing. After the scan Dr. Ginsburg, a very well-respected pediatric surgeon saw calcifications around her intestines. These were most likely caused by a perforation in her intestine which eventually healed itself. Ginsburg decided to do an exploratory surgery to check for a narrowing in the intestine where the perforation healed. She was also throwing up and releasing a ton of dark green bile through a repogle tube that goes from her stomach up through her mouth, a clear sign of intestinal problems. These issues could be what is causing Remy to be so backed up and swollen. So of course we agreed yes, let’s do exploratory surgery to see what we can do. 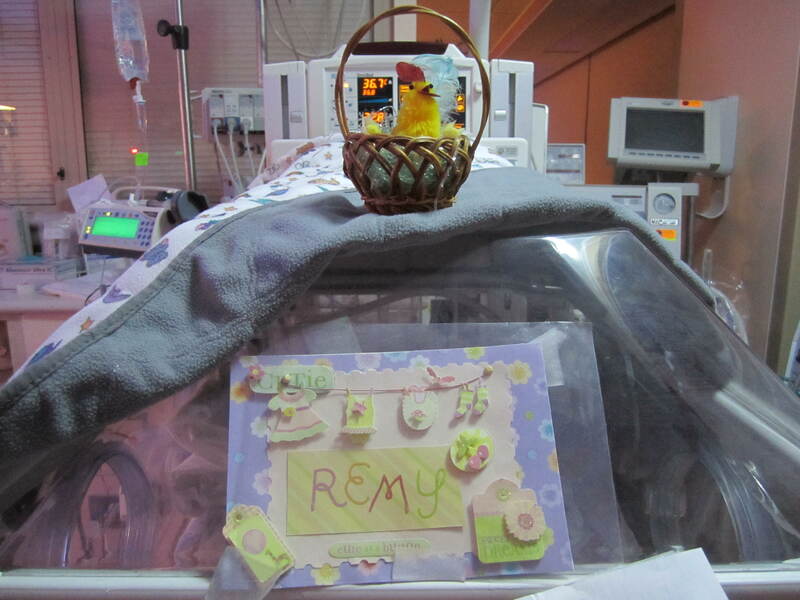 Over the weekend Remy remained stable, awaiting Monday’s surgery. We were worried she would get worse and either have to have emergency surgery or not be stable enough to have it on Monday. I had to work and it was very difficult being away. I was able to stop in for a very short time during the surgery, but my mom and sister came to the hospital to be with Mary. The good news is Remy did great. She is incredible and awesome and every great word you can imagine. Remy did in fact have a lot of dead intestinal tissue. Dr. Ginsberg removed 40 cm out of 120 cm of her small intestine. Which leaves her a considerable amount to live with. He explained to Mary that it could either have been NEC or a Volvulous, both in which the end result is dead tissue. We will never know the cause, or which one it was, but she definitely had one of them. The healing process has begun. She had a tough first night. 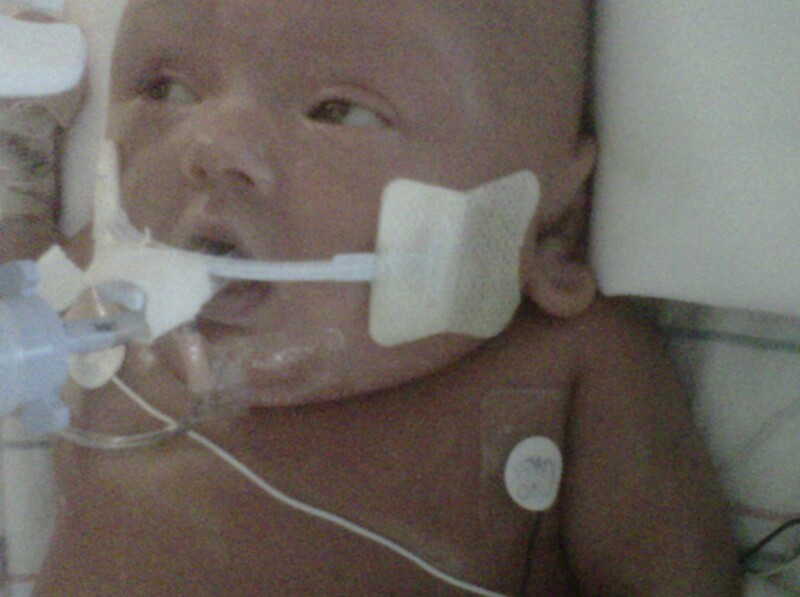 She struggled urinating, keeping her blood pressures up and is back on a high frequency ventilator at very high settings. She is swollen again, they are pumping her full of fluids again to make sure she doesn’t dehydrate. The second night was a little better. She is more swollen today and cannot open her eyes but this is expected. This is going to be a long, slow process. She will get better, she has to, but we have been warned she can get worse again in the process. She is in the beginning of a long healing process. She will be sick for a while, but when she does begin to get better we can hopefully get her lungs better, extubate and begin to feed her. We still don’t know what the long-term effects of all of this will be, but we will stay strong and take it day by day. In a few days she will have a bag colostomy bag attached to her. This will catch her poop while her intestines heal. She will have this bag for at least 6 weeks and maybe longer. One of the major concerns is that her Illocecal Valve, which is the valve that connects her small and large intestines, is very fragile. She needs this to heal or it could cause problems in both the short and long-term and would affect diet and bowel movements. Her lung is still a big concern as well. She has a cyst, rather a large pocket of air, that we hope will go away but instead has grown. Another concern is that she has required steroids to help her through all of her challenges. The steroids can interfere with her healing process. Weaning them down is necessary, but also a test of how well she can do without the steroids. She is back up on her Dopamine. She is on antibiotics, Zosen and Vancomysin. The seizures have been kept under control with heavy doses of Phenobarbitol and that will continue until she is in a stable enough state to be able to focus on that. This will be a while from now. She is very critical again, but stable. In many ways Remy is back at square one. She is worse off than she was from the day she was born. In other ways she has progressed and we are astounded by her great resilience. Her surgery was a success!!! We hope that this discovery and correction in her intestines will help improve her overall health rather than diminish it. We still have a very long road ahead. While its easier said than done we do our best to take it day by day. We are so thankful and lucky to have the staff that we do. We thank you so much for loving Remy and for helping her get better. It truly means the world to us. What a few weeks it has been! We have as usual experienced our fair share of ups and downs. Still the greatest news we could have hoped for is that the MRI which took place last Tuesday showed no signs of brain damage. As a far as neurology can see the brain looks to be completely functional and in good health. Our doctors, nurses, residents and so on were very surprised to see this. With all the trauma that Remy has experienced, the chances that the MRI would show something horrible were very likely. After hearing the news Mary and I were filled with emotion throughout the day not knowing what was coming at any given moment, tears, laughter, deep breaths and so on. There were some significant blood clots discovered in the sinus cavity, which is a vein between the brain and the skull. While these clots can be of extreme risk to Remy’s health, recent ultrasounds have suggested that they are decreasing and dissipating on their own. Metabolic blood samples have also been sent in for further review to make sure that there is nothing missed concerning the clots. Following the MRI for the next couple of days Remy was doing very well. Every day since she has opened her eyes at times throughout the day. Looking into her eyes, I describe it like being a six-year-old in Disney World. No matter how many times I look at her I am always in awe and so in love! It is ridiculous how amazing it feels to lock eyes with our little girl. It literally sends chill down our spines. On the other edge of the sword there are certainly concerns. Doctors cannot assure us that her brain is and has not been affected from all that Remy has experienced. It is possible that the growth of her brain has not developed as quickly as it should be is still a great concern. This is something we may not notice until years from now. There are still many unanswered questions we approach each and every day. Remy has continued her terrible habits. Seizures! Mary and I have grown a great fear and hatred for the ‘seizure’. While we have had some great moments over the past week our baby has gone through some long days and nights of severe seizure activity. They have been frequent and extremely concerning! We never know when they are coming. We never know how long they will last. We never know how severe they are. Any neonatal experiencing such frequent seizures is exposed to great risks. Those risks can be life threatening or can result in mental retardation, cerebral palsy, long-term epilepsy and more. Not only are we so concerned about the long-term and short-term effects, but it is evident that each time Remy experiences these horrible seizes she is set back greatly. Her progress halts. In fact she goes backwards. We have noticed the correlation in everything she does. Her edema usually increases quickly, which is something that takes a long time to reverse the effect. She appears less active. Her overall health without going into detail, takes several steps backward. Think of it this way. A storm hits your area, forget the severity for a moment. Consider trees are down, structures are damaged pipes are broken. Consider that this all happened in a short time over say an hour. Now think of how long it takes to repair clean up and bring back to a the state everything was before the storm. The damage happens quickly. The rebuilding takes time. In a nutshell here’s what is going on and needs to happen right now. Remy has seizures so we need to keep close tabs on her Phenobarbitol dosage which control her therapuetic levels. If it stays between 45 and 60, we feel comfortable that she won’t have any breakthrough seizures. She HAS to lose fluid. Not only is she swollen on the outside, but on the inside too. She needs to get back to a normal size in order for her intestines to be a normal size to have hope that they will begin to work correctly. We still need to rule out that she doesn’t have a malrotation in her intestine, but it looks unlikely. 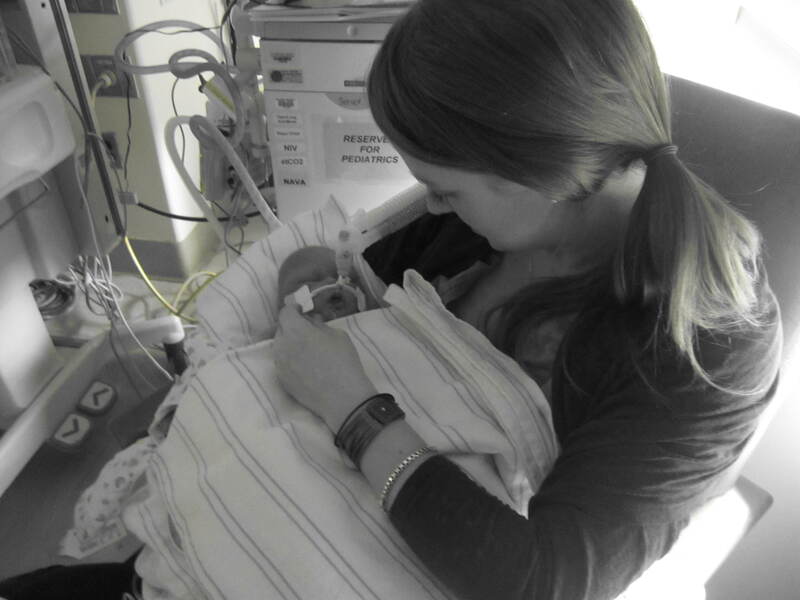 The longer she stays on TPN, the more likely her liver is to fail. Currently her blood gases show that her liver functions are great, so we are not too worried yet, but things happen fast here in the NICU. 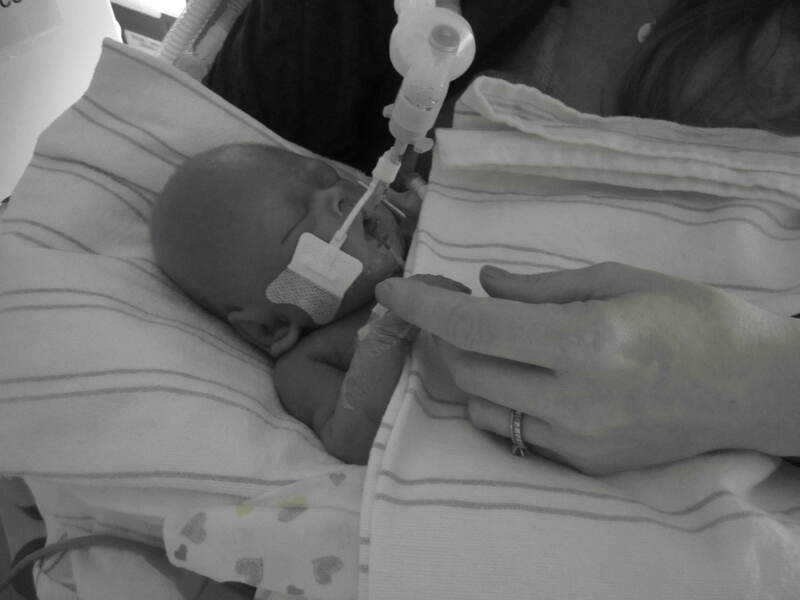 She HAS to get her lungs inflated (there’s collapse in both of them) in order for her to come off the ventilator. She is on very low settings on it, but she cannot come off of it until her lungs are ready. This can also be helped with fluid loss. We don’t know if there is a particular order this needs to happen in, but we need something to happen, and soon. While the staff here is amazing, Mary and I do not have a an open communication line with neurology like we do with the rest of the staff. 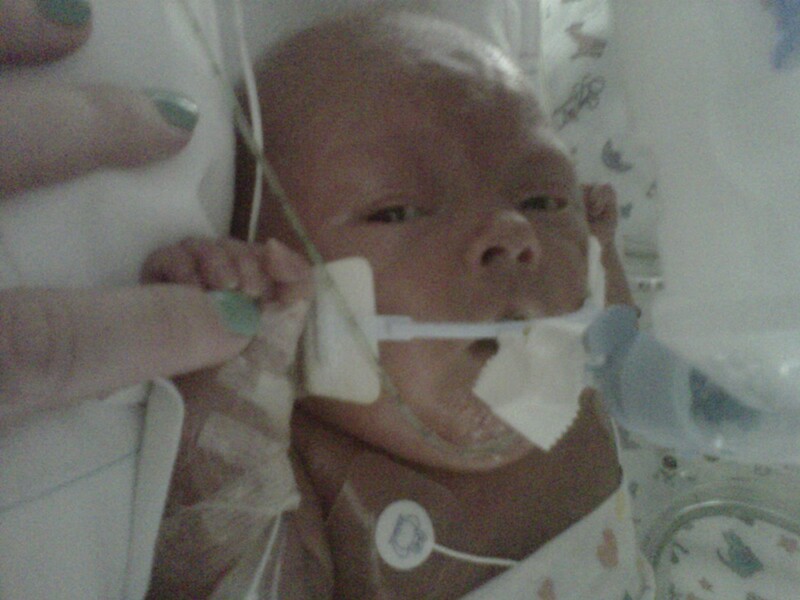 They are not part of the NICU. They interact with us like every department does, hemotology, infectious diseases, G.I., and so on. Respiratory is here all of the time They check on Remy throughout the day everyday, adjusting her settings speaking with us explaining to us what they are doing and what they expect the pros and the cons. We don’t get that from neurology. I could understand this if there were some decisive answers about why Remy is having seizures. How are they affecting her? What will the long and short-term effects be? If you know Mary and I, or even if you don’t and you just follow our story, you know that we are very easy-going. We are positive and fair even with this tough situation. Don’t get me wrong, we speak up when needed. At this moment though we do not understand why neurology who seems to know so little about why and what our girl is experiencing has so little contact with her and so little to offer us in explanation. Really, there are zero conclusions or theories as to what why she is going through this and this is no longer acceptable. In the background Mary and I are getting more aggressive and trying to change this. We DO VERY MUCH respect that there are great limitations on what neurology has been able to do because of Remy’s health and condition. We also realize often it is not the number one priority, because Remy has had so many issues. The bottom line is that now we need some sort of answers, and we will push and shove and rock the boat if we must, rather than living in regret down the road knowing we may have been able to influence and outcome that could have been avoided by our advocacy. It really boggles my mind that neurology is not way more active around Remy. I don’t care that her condition is extremely rare. This is my baby and I don’t care who I may offend. Since my last couple of posts Remy has taken some of Mary’s breast milk. That is a plus! The downside is that she was only able to tolerate it for 30 hours before her stomach started distending. The amount that she was able to handle was minuscule, only 15 cc’s. She is now very distended again and has gained significant weight and the consensus is that she is not ready for feeding again just yet, as it could disturb her and make things worse. She is now 11 weeks old and she is unable to feed. This is something that is definitely affecting her growth. She will probably have to start on a formula that is created for neonates that have issues similar to Remy which are very sensitive to any type of milk of formula. We just hope that she will be able to tolerate any type of feedings and soon. She is experiencing problems with her intestines again. She is releasing large amounts of bile through her replogle tube. There is great concern that she has issues with bowel movements. This in turn affects her kidneys and stomach as well. There is so much connected. At the moment feeding is not even an option. How long will it take. How much damage is being done not feeding. How much more will occur. This concern grows everyday. On top of everything. Our refrigerator/freezer died recently. We lost about 50 bags worth of breast milk that Mary has so diligently been pumping and storing. It was such a horrible feeling especially for Mary. To boot the first delivery of our new fridge was refused due to our small hallway space Eventually my brother-in-law James, a part-time mover and two of his guys came and helped us get the new one in. My Dad made it easy and did all the work to get the new one for us. These little things go such a long way, I cant even begin to explain what a headache this would have been without them right now. We love you both! We have cherished some the moments we have had with our little girl over the past few weeks. I was able to hold her for almost two hours after waiting more than 40 days. Mary kangarooed with her for over seven hours straight. Mary has been by her side all day everyday since she herself was released from the hospital. I am SO SO PROUD OF HER! I lately have missed many days due to long work hours and while I am very grateful to be working and realize it is what I must do, it still leaves a great void in my heart. She opens her eyes and like I said it is heaven on earth to see. We are grateful for what we have. Yet we are still watching babies come in and out every week. We watch so many others get to do things with their children that we cannot. We are not mad at them. We are jealous. There is no way that Remy will be leaving anytime soon. We have accepted that fact for now. But mentally what you must do to accept that fact is the hard part. Our little Remy still has many serious issues to be resolved. She is nowhere near out of the woods. Day to-day there is still no feeling of normalcy or expectation. Her condition changes quickly and frequently. She is very sensitive and yet very strong. She and her body are trying to tell us a and the staff at the NICU what needs to be done but we have still yet to figure it out. She remains as she did in the beginning a puzzle. To all of you following and anxiously to hear about Remy’s condition and what is happening Mary and I are grateful for all of the love, compassion, and generosity we have seen from people everywhere. While this blog is a great hep to me to Mary and to Remy in so many ways, at times it is just so difficult to update. Mary and I do think about all of you often and we never take for granted how lucky we are to be surrounded and protected by your love and we thank you for it from the bottom of our hearts. Here are some great pictures taken in the past week and a half . My apologies to everyone who has been waiting for this late but very very great. Due to long days in the hospital meeting with doctors and long days in the field I was unable to post. For those of you who have not heard Remy had her MRI. We had been waiting so long for this with nervous thoughts and butterflies and fear and hope all mixed together. The results showed significant blood clots between the brain and the skull in the sinus cavity. This could turn out to be a problem eventually. However, it is unlikely that it will. Chances are that it will dissipate on its own or with the treatment of blood thinners. Blood is being taken for several tests to be sure there is not a bigger threat. More importantly there was NO brain damage! This was the greatest news we could have received. It appears that our little girl has a brain that is functioning just fine! While there could be problems in development that we cannot see right now, we will address that in time if that should be the case As of now evidence does not suggest that. This is a moment we are so grateful for! There has been more going on this week (all good stuff) and I would love to share, but I will give a more extensive update in a few days. For now Happy Mothers Day to all the Moms out there. You deserve it! We are enjoying Mary’s first, and Remy is doing better and better each day opening her eyes more and more making us smile our faces off! As always thank you so much for your love and support! Thursday was a very special day for Remy. Though she does not know it yet, it was a day that Mary and I have been awaiting and envisioning since before Remy was even born. 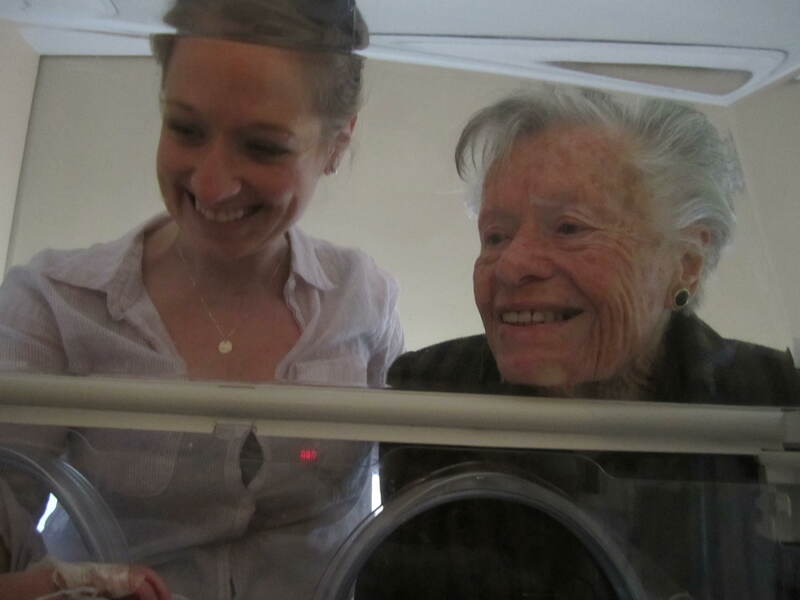 My Grandma, ‘our’ Grandma, Remy’s Great Grandma Theresia Dombrofski, got to meet her great-granddaughter and it was a healing experience for all of us. It was a healing of the soul. It was just one of those moments that you cannot really quantify in numbers or in theory or as to what kind of effect it can have; it just does! Standing tall and proud at 91 years old it was instantaneous joy. She showed concern and worry but did not cry or wince or display discomfort from what she had witnessed. This was a monumental moment. My grandma, who traveled from Czechoslovakia at the age of 16, due to the onset of WWII and Nazi Germany, who left behind several of her 9 brothers and sisters, who never again saw her mother and much of her family, stood over my child. Without her great sacrifice and her great contributions to our life neither me nor Remy would be here today. Overall, Monday through Thursday was a stretch of progress for Remy. Everyday she improved; her edema (unhealthy water weight) decreased, her collapsed left lung got better, her blood pressure, heart rate and oxygen levels, all either improved or remained steady. We were excited for the next step and were hopeful she would soon be moved to SIPAP! We said goodbye to my parents and Grams. My Grandma told the nurses she was so in love and wanted to take Remy home with her. After they left Remy again began to seize. This would go on for over 24 hours. Her seizures were again very intense. They took a while to control. Her meds were increased to heavy dosages and she was hit with everything. This went on until 9 pm on Friday evening. Sparing myself from having to relive the experience by writing in detail, I will just say that the second half of the day was not a good day for Mary or I and most of all, not for our little angel! Saturday came and it was yet another rough day. Remy was barely peeing again. Her edema had increased. Her blood pressure was low and she had to be put back on Dopamine. The Dopamine was also quickly increased. Again came fear of a possible infection, so she was put on antibiotics once again, Vancomycin and Zosen. Our baby has lived more days on antibiotics than without. Her leg was starting to bruise near her picc line in her leg, so it had to be moved to her arm. Thankfully, for the second half of the day and throughout the evening Remy started to improve once again. Through all of this, for the most part, her respiratory functions were steady and stable, though her left lung was still experiencing collapses it seems every other day. Sunday morning we arrived to an entire staff gathered around Remy. For a moment we freaked out in fear. It turned out to be a very good thing. 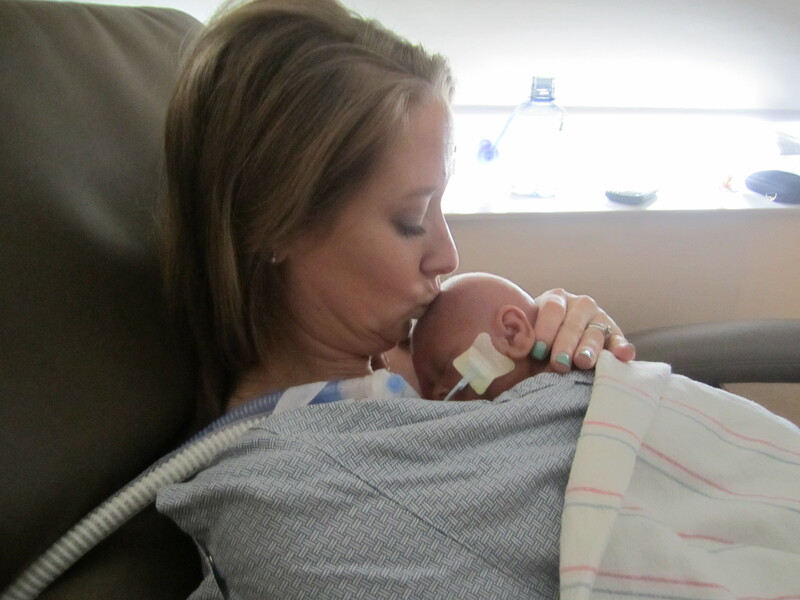 Despite the fact that Remy’s left lung had been collapsing and expanding over the past few days, Remy was extubated and re-intubated and moved onto a conventional breathing machine. It wasnt the SIPAP we were hoping for but it didn’t matter. This was the right step and it meant improvement. 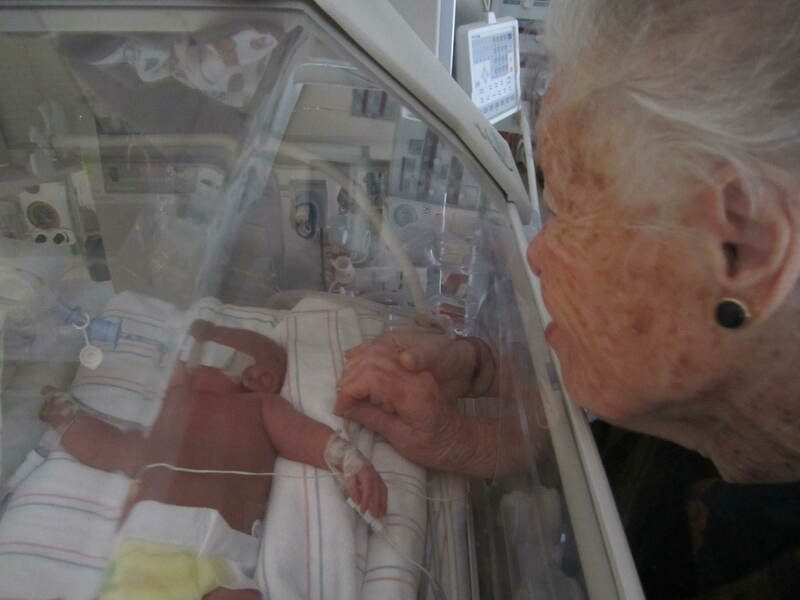 Rather then pumping several puffs of air in and out (about 400 a minute), she is now being given air at her normal breathing rate, and when she is able to breathe on her own, the machine recognizes that and her breathing assistance is decreased. This was a tremendous step for Remy. We had been waiting for this and hoping for this for so long now. 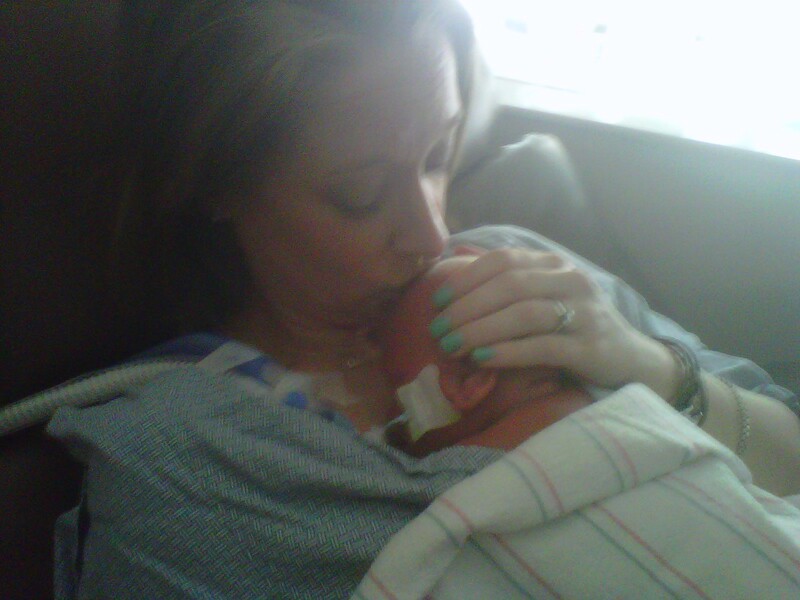 One of the greatest rewards was that Mary was finally able to hold Remy after waiting for 36 days. It was not skin to skin like kangarooing, but the joy and feeling that it brought to Mary was priceless and for Remy we know it is important that we hold her as often as we can. Sunday was a great, great day!! Sunday night we were excited to find out that Remy had peed 190 cc’s in one sitting. Are you kidding?! I mean she doubled her 10 hour record in one diaper in one diaper. This was fantastic and has continued through Monday with record-breaking urine counts. My god, I never thought I would even care about something like that, yet alone write about it! Backtracking to Sunday evening on the opposite spectrum Remy had developed a fever of 102.1; the highest temperature she has ever been. This was needless to say a big scare. The fever would decrease throughout the night her temperature was back to normal by morning. Below pics of Mary finally getting to hold our Remy once again after a 36 day wait and Grams with Remy. Can I get a SIPAP please! Late Friday night I finished my assignment and was looking forward to hanging out with Mary and Remy during a seven-day break. Saturday morning came and we were off to our daily hospital routine. Mary had her coffee. I had my green tea we had a few bananas and some snacks packed and we were off. It was a pretty good morning. My sister Dawn came to visit a little after noon. 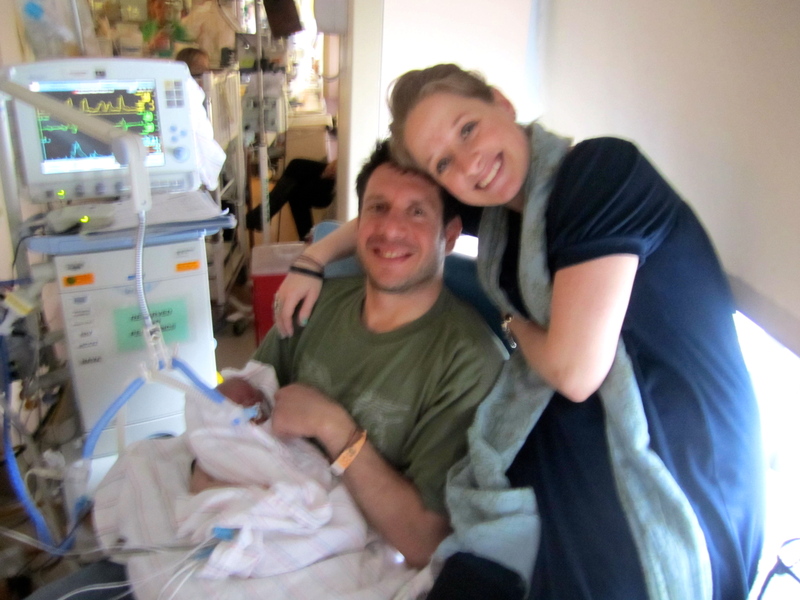 We caught up and hung out bedside with Remy and ate lunch in the NICU. Remy was content, until about four o’clock, when Dawn headed out. Little did we know Remy was just behaving for her Aunt Dawn. The rest of the day was not content. Remy had begun to experience more seizures. She has done this before on many occasions, but these were more like the original seizures she experienced about six or seven weeks ago. We held her hand and pleaded with her to stop seizing. A few hours later she stopped seizing and they seemed to get them under control after upping her dosages of Phenobarbitol, Ativan, Keppra and Fosphenytoin, all of which slow down the brain activity. We had seen this before, but being that she had been experiencing so many seizures this week it was tougher than usual to accept. Easter Sunday came. We passed on dinner with our family in Long Island, and though they wanted to come and be with us we needed to be alone with our baby girl all day. This day would turn out to be an even more difficult day for Remy. Her seizures had continued on and off through the late afternoon into the early evening. The seizure activity was extremely frequent and they for lasted long periods. They continued steadily for about thirty minutes at a time with maybe five-minute breaks. They look like little electric shocks going through her body every second. Her arms, legs fingers toes all jerk simultaneously. 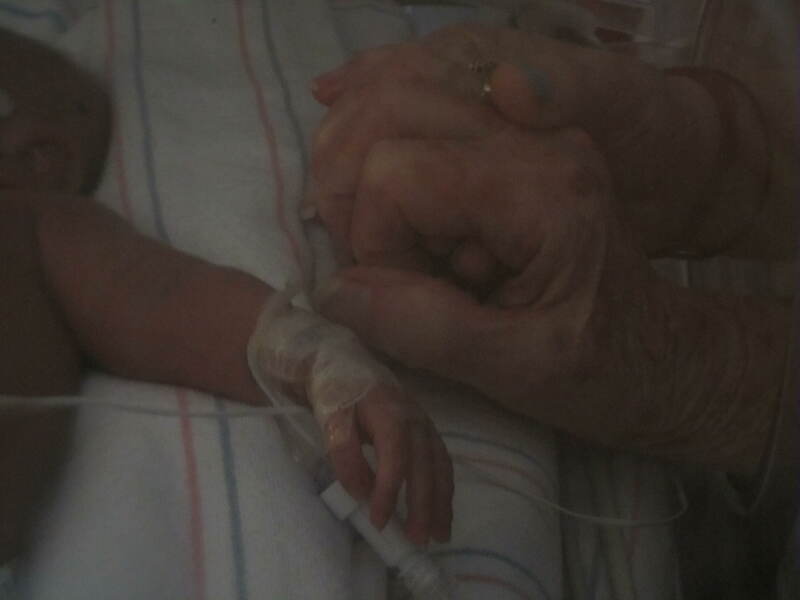 We held her hands and feet and talked to her over and over, pleading with her to get better. I can’t describe what goes through my mind watching this happen, except that at this point I am losing my mind. This went on for half the day. Thankfully due to the high doses of medication she was given, she eventually stopped. Still we cannot do an MRI because she is in no state to do so. An MRI would give us more accurate idea of what may or may not be going on under that little skull of hers. It’s a huge concern. Could this be damaging her brain? Could it be affecting her in the long term? Yes. On the other hand, it could be cranial reaction that has yet to do any damage. Her motor functions work well. She grabs, jerks and clenches, yawns, licks her lips and reacts dramatically at times and this is all positive. We can feel her presence. She has reactions like you and I. Though we cannot hear anything because she is intubated she cries, yawns, gets pissed off. You can tell when she is uncomfortable or hurting. Yesterday her chest tube was removed after being clamped for 72 hours. Unlike last week the x-ray four hours later showed no air accumulation after the fact, and for now it does not need to be reinserted. This is a small victory and what we hope is a sign of more to come. She is peeing like crazy, about 140 cc’s just in just a 10 hour span yesterday. Not by measurement, but in comparison its the equivalent of what you would have to pee after during a heavy night of beer drinking. If there were an over/under on her urine output Remy covered the over by a long shot. This morning has been great so far. Mary and I woke up to some Bob Marley’s, Three Little Birds. 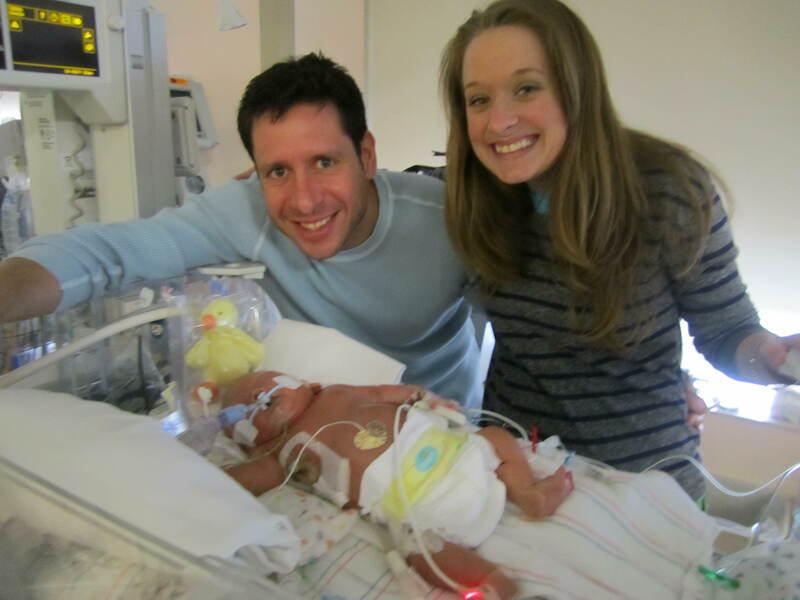 We called in to the NICU beforehand and Remy’s still hangin’ strong! Her levels continue to be weaned down on her oscillator and it is a strong possibility that she will come off this week and go to SIPAP. In other words; WE MAY BE ABLE TO HOLD HER THIS WEEK! It’s been about a month since we have been able to do so. We are really hoping this comes to fruition quickly. We are feeling so good today, the sun is shining and so are our faces! Mary just shed some tears of joy when we were told of the possibility of SIPAP. We have new energy today! There is a reservation under the name ‘Remy Zappulla’ for a SIPAP, which could be seen as early as tomorrow if we are lucky. We have asked our daughter to spare us of any surprises and stay the course! We took some Easter pics this week of Remy. Aunt Brenda got her a baby duck, which we put in a plastic bag so no germs get to her, and Mom T. brought us Mary’s first Easter basket from 1980. (Mary was born the night before Easter). Hopefully this will be our last Easter indoors. Bring on the park next year! It has been tough to get out posts the past few weeks. This is my first phone post. With long work days, visits to the hospital whenever I am not working and just so much to catch up on in everyday life it grows tougher to keep a grip on everything. I was able to spend the day with my girls on Wednesday. We had a good day overall. It has been a tough week. Mary has especially been hit hard. Remy has seen some ups and downs this week. While she is now peeing like crazy and releasing fluids she is not losing much weight. Her chest tube was removed and then had to be reinserted just four hours later, due to air accumulation outside the right lung. Her left lung collapsed improved and again collapsed and improved. Her eyes are still unable to open despite some short moments of squinting. She remains swollen and the staff is having trouble locating good veins to move her I.V. lines, as this has been necessary to do. Her oxygen settings needed to be raised, btut she was taken of the nitric. We are being patient, as patient as possible, but it is growing more difficult. We worry about our baby girl so much. We have watched so many new babies arrive, and so many recently leave. While extremely happy for our newfound friends and there healthy babies, we want so much to see our little Remy follow in their footsteps and see progress now! We had lunch with our cousin Cindy, who is like a sister to me. For those of you who don’t know, she has had the great misfortune of watching her 3-year-old son Ty suffer from cancer and has spent her past nine months practically residing in the hospital full-time. It was so great to spend even a short time together. We talked about how we just want our babies to stop suffering and be okay, and how much our lives and perspectives have changed in so many ways. We are going through two very different experiences but share so many of the same. Most of all, we want for our children to be okay and would trade places in a second with them if we could, and we ourselves just want to get back to worrying about normal stress. Mary and I know that Remy has a long road ahead of her. We do not feel sorry for ourselves. We are just drained and scared and want to hold our girl again. Remy has been on different means of life support for close to a month now and while she has made improvement in many ways her status still remains in limbo. We continue to remain strong, to move forward and to work with Remy’s doctors and influence their decisions whenever we feel we must. We are enamored by their talents, care and dedication. We will continue to fight this fight with our baby girl and keep our strength and hope alive and well. We are deflated very often but still going and not pessimistic. We are human, and if the tone of this post sounds like we have been beat down, well we have. However, each day is a new day, and we remember no matter how hard this becomes it much more about our baby girl than it is about us. It is okay that sometimes we will get beat down, it is just important that we get back up and stand strong for our girl!